I aspire to write my first book, working title: Designed for Life. It is an expansion on our Design Philosophy, as its been discovered through our work at Lovesac, and embodied by our star product: Sactionals. I believe that Sactionals might be the first (and hopefully not last) Designed for Life product. My hope is that countless entrepreneurs someday adopt this philosophy and a revolution in (durable goods) product design comes to fruition. Below is a small excerpt from the preface of my book–still a work in progress. I plan to share more previews on this blog as it continues to unfold. It will appear as our standard to live up to, on the walls of Lovesac stores everywhere. PREDICTION: Durable product-based companies will no longer lead our economic growth. The days of Apple being “the biggest company in the world,” and its growth story are over…but the economy will be just fine. The industrial revolution of the 19th century was originally fueled by innovation in one industry. In fact, the word “industry” before 1880 meant one thing: cotton. The systems, processes, management theory, and machinery that came along with the modernization of the textile industry in America paved the way for ongoing innovation and business practices in every “industry” since from automobiles to electronics. It would be impossible to stand in 1850 and imagine massive economic growth without cotton driving it…let alone child labor, slavery, and the many other “critical,” and consequential components of the burgeoning economy at that time. How could unfettered growth be expected to continue without these things? Yet we wake up today, well into the new millennium, having witnessed unceasing, exponential, even monumental economic growth in the United States…and where is cotton? We somehow have done just fine without it as the zenith of our economic engine. At some point it faded into the background or went offshore, yet our economy marched on without it. We will continue to see the economy expand and evolve even as the industrial revolution becomes a chapter in history, the technological revolution, some might argue, is nearly complete, and this new “Knowledge Worker Economy,” as coined by author Steven Covey, comes to fruition. It is no longer necessary for products to be the driving force of our economy—certainly not durable goods. This economic revolution we are living through right now will allow a new paradigm to emerge—where companies like Apple, who are rooted in the preceding paradigm, are absolutely caught in the Innovator’s Dilemma that Clayton Christensen thoughtfully exposes in his book of the same name. What’s more, most large companies are so entangled in the realities of our finance industries’ “Capitalists Dilemma” that Mr. Christensen has since exposed, that there is no likely trajectory change for them. Companies like mine still have a choice. Consumers like you and me will likewise have a choice…and for many reasons, in this new economy we will choose Designed for Life products. The time is ripe for the small to eat the big. 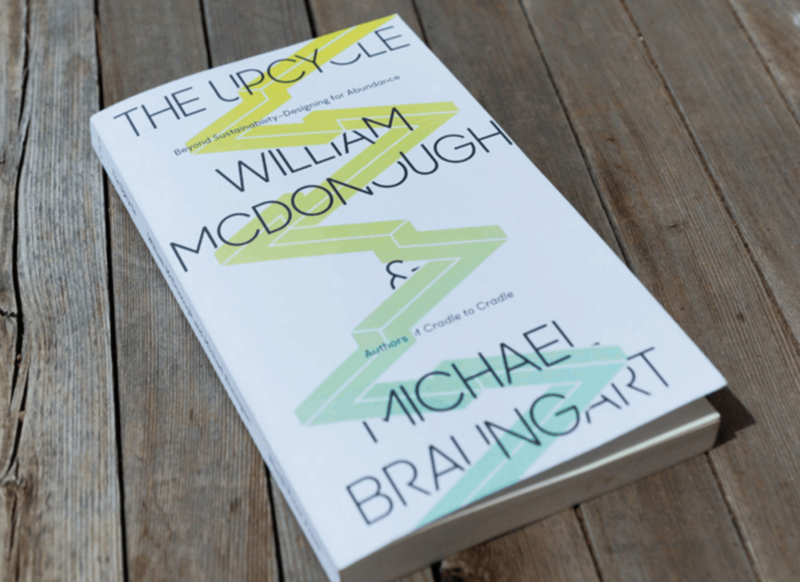 One of my big inspirations for this philosophy, and the book, is the work of William McDonough and Michael Braungart. At this moment, I am just finishing their amazing work, The Upcycle. It, by my estimation, the most well-informed and up-to-date long-form work in the area of sustainability and I encourage everyone on the planet to read it….especially policy makers and entrepreneurs. Please check it out. This entry was posted in Designed for Life Philosophy, What I'm Reading and tagged books, business books, Design, Designed for Life, durable goods, durables, personal development, Philosophy, product design, reading, shawn nelson, sustainability, sustainable, upcycle on May 27, 2016 by Shawn Nelson.